The Sterilight Silver™ line of disinfection systems is the long time “workhorse” of the Sterilight product line. Its compact design is ideally suited for domestic Point Of Use (POU) or Point Of Entry (POE – whole home), vending machines, Reverse Osmosis (RO), pre or post disinfection. In addition the Silver units have found their way into light commercial applications including Rainwater Harvesting. The high output germicidal lamps provide an economical way of treating water requiring a 99.9% reduction in bacteria and viruses. This process is accomplished without adding any potentially harmful chemicals to your drinking water. The Sterilight Silver™ range is the most economical and ecological way of treating your water. These simplified designs allows for easy maintenance, without compromising performance. The UV lamp can be changed without interrupting the water flow. The quartz sleeve design allows for maximum UV output and operating efficiency. These UV systems are available in many sizes to suit applications. 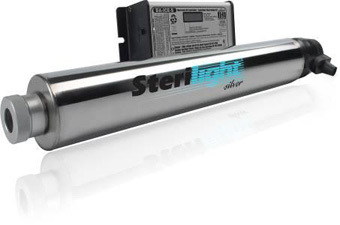 Sterilume™-EX coated low pressure germicidal UV lamps, provide an economical way of treating water requiring a 99.99% reduction in bacteria, viruses and protozoan cysts (Giardia lamblia and Cryptosporidium). These lamps feature a proprietary coating providing consistent UV output over the life of the lamp (9000 hours) to ensure continuous disinfection. Silver™ ICE controller provides constant output current and a universal power input (100-240V./50-60Hz. ), as well as visually displaying remaining lamp life and total days of operation and in the monitored systems, % UV output. The controller will go into alarm if the lamp fails for any reason to notify you of the failure. What Does The Monitored System Do? Monitored systems have a true 254nm UV intensity monitor to warn you of any changes in water quality that may cause the water to become unsafe to drink. A powered solenoid output allows a normally closed solenoid valve (sold separately) to be connected directly into the controller. This valve will stop the water flow when the intensity monitor indicates the water may be unsafe to drink. The systems comprise of a treatment chamber manufactured from 304SS Stainless Steel and separate controller/ballast assembly. It is delivered with fixing clips for the chamber. For domestic applications that require additional filtering we can provide an Integrated Home System, so click here to see our IHS12 system. The Sterilight range comes with a exceptional warranty package. Disinfection systems carry a ten year warranty on the stainless steel reactor chamber, a one year warranty on UV lamps, quartz sleeves and UV sensors, and a five year warranty on all other components. Please see the Warranty PDF document for full details. 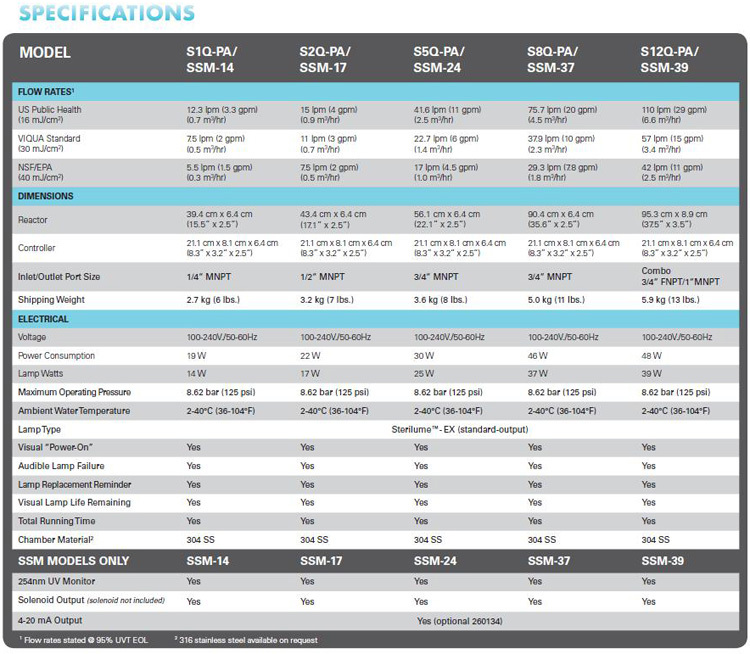 For full specifications of the Sterilight range of units, please see the table below.